“Have you ever considered the priesthood?” It’s a striking question, one not normally considered by most people. But perhaps more of us should! After all, priests don’t hatch out of eggs or grow by the riverbank in some exotic jungle. They come from the same pews you sit in every Sunday, from the same Sunday School classrooms your children enjoy, from the same home groups and Bible studies that help you grow in your faith, hope, and love. One of Bishop George Sumner's major goals for his episcopate is to raise up a new generation of faithful, evangelistic, and mission-minded clergy to lead our diocese and the broader church well into the 21st Century. For a number of years running our diocese has been a leader nation-wide in raising up vocations in the Episcopal Church. I’m willing to guess many of you have known at least one or two people who have gone on to be priests. You can brag, “I knew them when!” Faced with the prospect of nation-wide denominational decline, one can safely say that within living memory we’ve never needed quality clergy so badly, and quite frankly, they only come from Christians and congregations committed to praying and investing in the future of the church. Part of the challenge we face is recruiting quality candidates for the priesthood. We’ve found some good ones, but we need far more! Another hurdle confronting us has to do with having a vision for what exactly the riches of the Anglican tradition are, and how they’re best employed in compelling, successful Gospel ministry in the 21st Century. Our church is in significant need of a sustained discussion along these lines. Our future depends on it. This Fall we’ll be presented with a remarkable, truly one-of-a-kind opportunity to have such a conversation, and to recruit future priests. For a couple years our bishop and a number of like-minded bishops and clergy have been dreaming about a major conference to attract and recruit new talent, and we’re pleased to announce that this conference will be held this Fall at the Church of the Incarnation, from September 20-22. Bishops and seminaries from across North America will be present, and I believe it’s safe to say that never again in our lifetime will a conference of this sort be able to attract such an impressive list of keynote speakers: The Most Reverend Justin Welby, Archbishop of Canterbury; Archbishop Josiah Idowu-Fearon, General Secretary of the Anglican Communion; Bishop NT Wright of the University of St. Andrew’s, Scotland; Prof. Stanley Hauerwas of Duke University; Prof. Oliver O’Donovan, University of Edinburgh; Prof. Ephraim Radner, Wycliffe College; and an all-star cast of younger scholars and clergy will be presenting to represent the next generation of leadership in the church. We believe the name of the conference goes a long way towards describing its character and mission: Ancient Order, Radical Vocation: The Anglican Priesthood as 21st Century Call. We’re calling it ‘RadVo’ for short. This incredible lineup will go a long ways towards ensuring a successful conference; but again, success only truly comes about when the faithful pray and support the mission of the church. 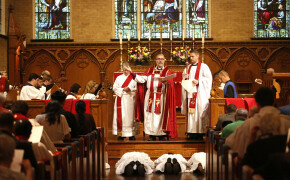 Do you hope for a revitalized Episcopal Church? Do you long to see the riches of the Anglican tradition passed on to subsequent generations, that our children and grandchildren will be able to hear the Gospel of Jesus Christ in the beauty and profundity you regularly enjoy? Pray for RadVo, and ask how you might support the conference in practical ways as well. For more information about the vision and content of the conference, to learn how to help, or to make a gift towards the conference, please email me at . And finally, do you know any young (or young-ish!) people who might have a call to ministry? You might encourage them to consider attending, and parishes might well consider paying for a number of your young people to attend. Or maybe you need to register to come and discern for yourself! Our website is the best place to find further information on content and how to register: https://www.radvoco.org/. God-willing, our Lord will use this conference to bring glory to himself, and it will be of real benefit to the church in the time of great need. As we head into Pentecost my prayer is that he will fill your hearts with a love of his church, and that he will continue to give you wisdom and discernment as you continue to embrace your own vocation in the life of his body, whatever that may be.